Persian in game: 436 Who? Important notice! 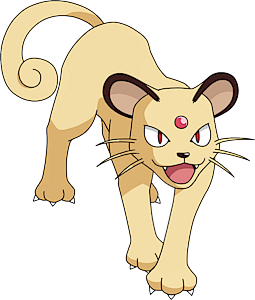 Pokemon Persian is a fictional character of humans. 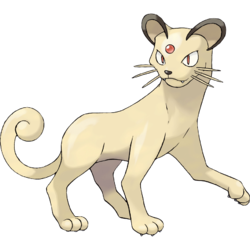 In Alola, Persian has a regional variant that is Dark-type. 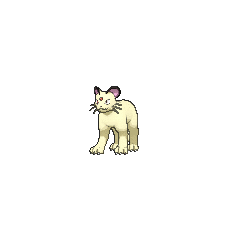 It evolves from Alolan Meowth when leveled up with high friendship. Persian is a large, quadruped, feline Pokémon. Its fur is pale tan with the exception of its black-rimmed ears. It has a short muzzle with a small, black nose, red eyes with slit pupils, rounded ears, a pair of pointed teeth in its upper jaw, and three whiskers on either side of its face. Its thick whiskers are very sensitive to changes in air movements, enabling it to detect its prey by movement alone. In the center of its forehead is a red jewel. Its long tail has a distinctive curl at the end. Persian communicates with body language, and holds its tail upright to signal its intention to pounce. It has long legs and three-toed paws with retractible claws. Persian's lithe muscles also enable it to walk without making a sound. Persian normally lives in towns and cities. Although popular for its elegance, it is extremely difficult to raise as a pet due to its fickle and temperamental personality. It will scratch anyone, including its Trainer, with little or no provocation, and has been observed ripping its prey apart for no discernible reason. However, when a Persian is yanked by its whiskers, it becomes temporarily docile for unknown reasons. In the past, Pay Day was its signature move. Alolan Persian has a body that is similar to its regular counterpart, but is grey-blue in color. Its face, however, has a different shape, being larger and more rounded with noticeable jowls. This distinctive face is admired by the people of Alola. Its eyes are usually in a half-closed state, and instead of a red forehead jewel, it has a blue jewel. In behavior, it is described as highly intelligent and having an even higher opinion of itself. It uses underhanded tactics in battle, but its haughty personality causes it to underestimate opponents. Giovanni has a Persian that is his primary Pokémon. It first appeared in Battle Aboard the St. Anne. While it is almost always seen at his side, it was only seen battling once. Meowth of Team Rocket seems to be its "rival" as Giovanni's "top cat." Ash battled a Persian in The Mandarin Island Miss-Match. 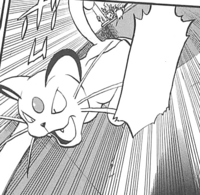 The Classy Cat Pokémon was taken out by Ash's Squirtle after hitting it with Thunderbolt. 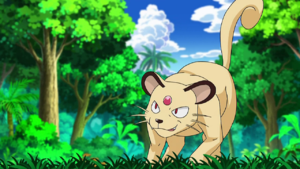 In Saved by the Beldum!, Tyson's Meowth defeated a Persian owned by a girl named Vivica during the preliminaries of the Ever Grande Conference. 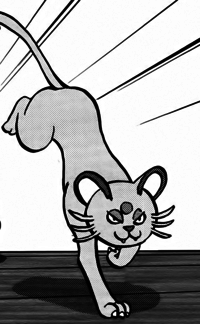 A Persian also appeared in Genesect and the Legend Awakened battling the Genesect Army at Pokémon Hills. An Alolan Persian made its debut in SM007. In The Problem with Paras, Cassandra's grandmother found a Persian sleeping in the backyard. She decided that it, and not Meowth, should be Cassandra's company mascot. 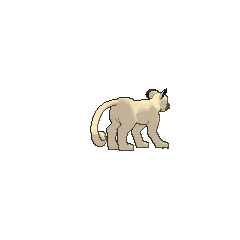 A Persian appeared in Beauty and the Breeder where it participated in a Pokémon breeding competition. 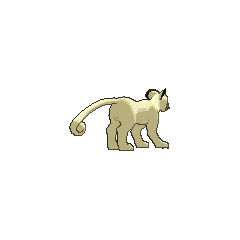 A Persian appeared in Ecruteak City in The Reawakening. In Purrrr-sian, Super Nerd Miles is seen using a Persian to attack Yellow. It scratches the walls of buildings to compose dissonance to disorient Yellow. Sird also has a Persian as one of her main team members. While it was probably well-trained and helped Sird obtain her position in Team Rocket, it lost to Lorelei's Slowking, forcing her to pursue other means to win the battle. In the Sun & Moon chapter, a Persian appears with a Meowth in a book owned by a young Sun, while he was talking to his grandfather on a video chat. 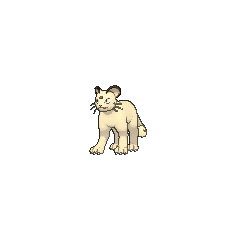 An Alolan Persian under the ownership of Nanu first appeared in the Sun & Moon chapter, where it was used to battle against Olivia's Lycanroc. Giovanni's Persian was seen watching him in Ash vs. Gary as his anger fades away from remembering the giant Slowpoke that Team Rocket scientists breed. 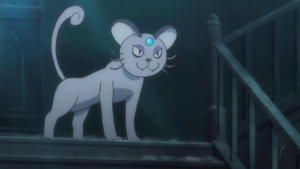 Unlike the normal Persian, Alolan Persian appears to be based more on domestic cats that underwent selective breeding, specifically those owned by royalty. In particular, its appearance greatly resembles a British Shorthair, an imported breed known well for its large and rounded head, which developed as a consequence of inbreeding due to isolation from other cats. Its jewel color may be a visual pun on the "British Blue" variant.